Not Too Many Christmas Games Are Available In Google Play Store Which Worth Playing. Google’s Santa Tracker App Has Some Mini Games But Not So Much Great. This Christmas, A New Game Is Published By “Hatrabbit” For Kids “Merry Snowballs”. 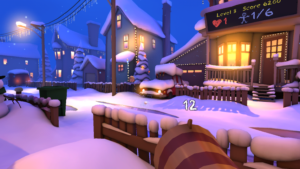 It’s A Snowball Shooting Game In Which You Shoot Neighborhood Kids, Gingerbread Men, And Santa[At The End]. Christmas Theme, Snow Fall Animation, And Gameplay Attract You To Play The Game Now. It’s Easy To Play This Christmas Game – You Just Have To Target Kids And Tap To Release Snow Ball. Three Types Of Controls Are Featured In This Game – You Can Choose Any One Like Touch/Joystick, VR, And 360. Choose Joystick Option. Because It Is Better And You Can Easily Play The Game. Simply Hold Down Your Finger On The Left Screen To Change View[Left, Right, Up, Down], Or To Shoot Snowballs Tap On The Right Screen. Kids Can Also Shoot You With Snowballs, You Have To Protect Yourself – Simply Long Press On The Screen To Stop Snowballs. They Can Attack You From Anywhere, So Be Alert. While Playing Game, You Have The Chance To Equip Some Gadgets Like Ice Gun, Triple Gun, Slow Motion, Blizzard, Lightning, Snowball Gun, And More. When Someone Shoot You, You Will Lose Health[Can Be Restore If You Grab Hearts In The Middle Of The Game]. Overall, It’s One Of The Best Christmas Game On Android With Awesome Graphics, Addictive Gameplay. Must Play If You Want To Shoot Snowballs!! Price – Free[Contains Ads, In-App Purchase]. Size – Varies/85 MB[Approx.]. Download – Here[Google Play Store.